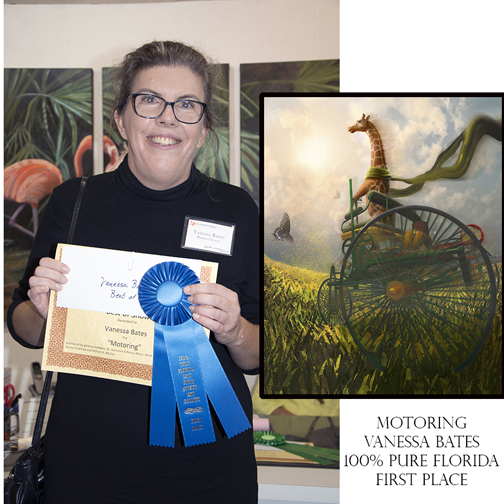 Awards for the twelfth annual 100% Pure Florida exhibit were presented at Fifth Avenue Art Gallery at Friday evening's opening reception. First Place went to Vanessa Bates, from Merritt Island, for her digital work, Motoring. Vanessa received $500 and a solo exhibit at Fifth Avenue Art Gallery in 2018. This award was sponsored by the following people: Dr. Karamvir & Nancy Mann, Nancy Crawford, Mark & Lois Mittleman, & William McCoy. Second Place was awarded to Mindy Colton of Orlando for Unbridled Sea Horse, a sculpture, which brought her a $300 award sponsored by John and Susan Hopkins. Our Third Place honor went to Carmen Sarmiento, from Hialeah, for her acrylic work, Royal Poinciana Flower. This award was sponsored by Southern Janitor Supply. The seven merit awards of $100 each went to Linda Barone, Naples, for Red Shouldered Hawk Encroached, acrylic; John Cielukowski, Cocoa Beach, Highnoon, Frostproof, FL, Acrylic; Louise Hill, Mims, Summer Creepin' In, Photography; Ellen Lindner, Melbourne, Lava to the Sea, Fabric Collage; Kestrel Michaud, Melbourne, Classy, Fabric; Melissa Miller Nece, Palm Harbor, Dash and Dive, Colored Pencil, and Mark Palmer, Rockledge, Lazy Sunday, Mixed Media. The merit awards were sponsored by John and Darcia Francey, Smile Design & Wellness Center, Jini James, Art Gallery of Viera, Titusville Art League, Art & Antiques Studio, and Brevard Watercolor Society. 57 artists entered the juried competition this year with 182 pieces of art. 57 pieces were chosen, representing 42 artists. Of these 42, 30 are from Brevard County while the remaining 12 are from outside of the county. There are 12 types of media represented by this diverse group. “Pure Florida” refers to the artists’ residence. Subject matter is unlimited. Ms. Moore holds a BFA with a specialization in painting & printmaking from the University of Central Florida, and has created and exhibited her work both nationally and abroad. When she’s not exploring the Mayan ruins of Central America, the architecture and ornament of Southeast Asia, or the beauty of India by rail, Kellie lives & works between the Caribbean and Central Florida where she creates functional & decorative ceramics inspired by nature and the observations from her travels.